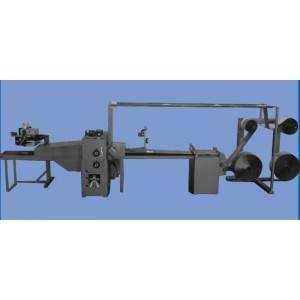 Model 600 is ideal for packaging batch or similar sized products in a three dimensional package. Products range from books, machine parts, crankshifts and automobile engine blocks. Model 600 can easily be set up to run flat packages as well. The lower web of the material runs over the infeed table and carries the product into the sealing portion. This is where the Upper Roll of material joins the product to form the protective pouch. The machine uses pre-set length counters to regulate the package size.